I've received several messages via email and Twitter the last few days asking me why I'm not talking about "the hurricane"? For the last week, the computer models have been forecasting a hurricane to strike the United States. Unfortunately, there has been zero consistency as to location: All the way from Galveston to Florida to North Carolina to out in the Atlantic (missing the U.S. entirely). As I have previously stated, I dislike the "hyping" of every wave that comes off Africa, somethings leading to "ten days of anxiety followed by three days of actual warnings." 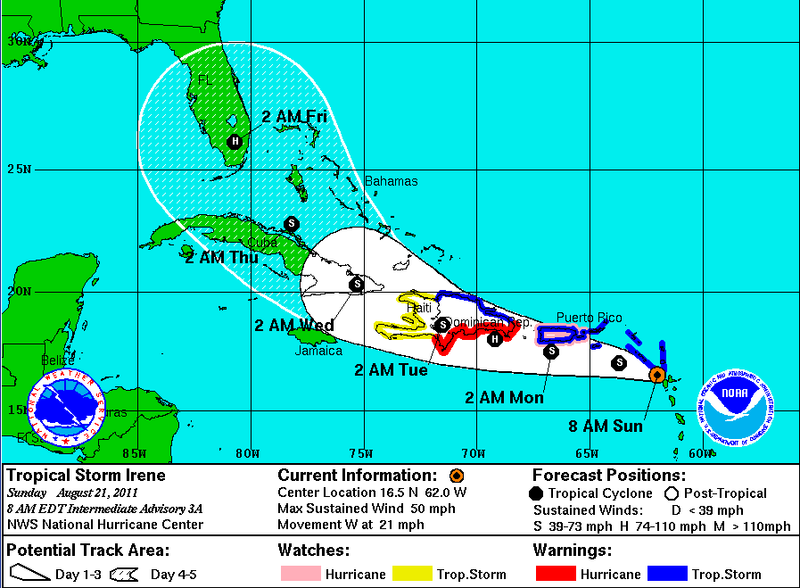 That said, we now have tropical storm Irene. It does have the potential to strike Florida or one of the bordering states and it does have the potential to be a hurricane. When you view the map above, let me suggest that you concentrate on the hatched area rather than the dark circles, as we really can't say what part of Florida is yet at risk. Keep your car's gas tank full. Spend $25 or so to buy an electrical inverter. Get any medical prescriptions refilled now, even if you haven't completely run out. That's it for now...enjoy the rest of your weekend. There is no need to be concerned until watches or warnings are issued. UPDATE, 11:35am Sunday. 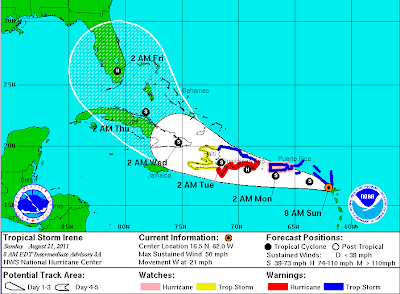 Latest computer models (see post above) are taking Irene in the eastern part of the path shown in this post, perhaps just brushing Florida and moving into South Carolina. Thanks, Glenn, and Welcome Instapundit Readers. Please take a moment to look around the blog while you are here. If you live in a major urban area, that inverter may not be enough. When Ike hit Houston, much of the city was out of power for three weeks. Areas with an underground grid often got restored quickly, but there were too many trees taking out too many power lines elsewhere. For a direct hit, a generator that can power your freezer (and maybe a portable A/C) is invaluable. FYI, if you want it to run a computer and/or router, you'll need a UPS or an expensive "cleaner" (I forget what the device is actually called) -- generators do not produce a clean enough sine wave for these systems. The inverters run off your car battery. You can recharge your car battery by running the engine. The best thing you can do is gas up your car and make sure you have some food that doesn't need refrigeration and some bottled water tucked away. Do it before the panic sets in. Agree with both of the above comments. However, these are what I recommend with a hurricane looming out 5 - 7 days with the location of landfall very much in doubt. None of what I'm suggesting -- at this stage -- has a significant cost (i.e., you'll still use the medicine eventually). This changes when the forecasts get more certain and the time until landfall gets shorter. If you would like to have a generator anyway, be my guest. I think it is good to have at any time.